In the war of Schleswig-Holstein (1848-50), a mine field was planted to defend Kiel Harbor. Wine barrels were used as mine cases and held a 300 lbs. (136 kg) charge of gunpowder. These were controlled by a shore installation, which had a wet battery for each mine to heat a platinum wire placed in the middle of the charge. The Danes learned of this field and made no attack on Kiel, but it is not known how much if any effect the existence of the mine field had on their decision. In the Austria-German War of 1866, the coasts of Istria and Dalmatia were defended by fairly dense mine fields. In 1868, the Hertz horn was invented (see British Mines and USN Mines) and by 1914 these had become the most reliable way to detonate contact mines. During the Franco-German War of 1870, the Jode, Elbe and Weser rivers were defended by mine fields. Soon after the war and union of the German states, Germany began a large mine development program and by the time of World War I was well able to wage mine warfare. 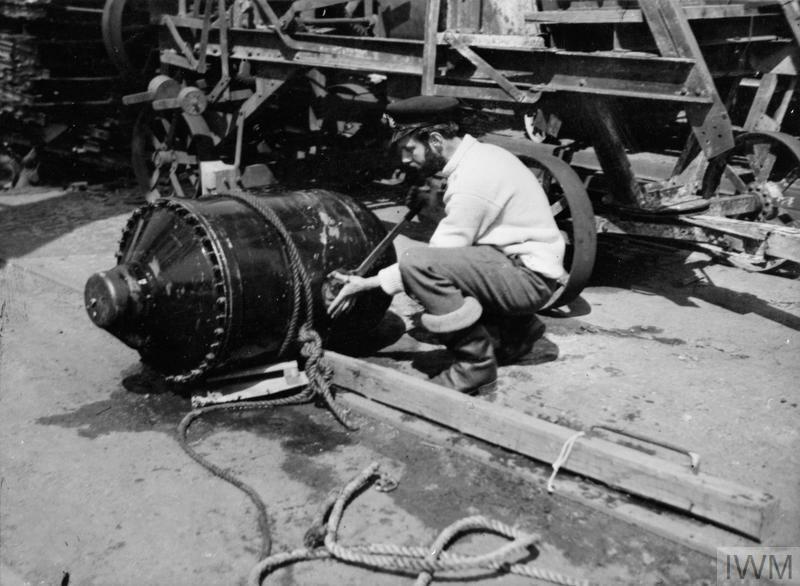 Large stocks of reliable Hertz horn contact mines were available, all equipped with automatic anchors that used hydrostats to set mine depth and lock the mooring cables. Most of her capital ships and cruisers as well as many destroyers and auxiliary vessels were able to lay mines. On-going research included a program for laying mines via U-boats. German mines had a high reputation in both World Wars for reliability and innovation. The British paid perhaps the ultimate compliment in 1917 by copying a captured German Hertz horned mine to produce their first reliable contact mine. Following World War I, Germany established a mine warfare research and development command in 1920. Airborne mines were successfully tested in 1931 and acoustic and magnetic mines were developed before the war started. Some 1,500 magnetic mines were available in the spring of 1940, far short of the 50,000 originally ordered. Pressure mines were developed in 1943 but not used until the night of 6-7 June 1944 in the Normandy invasion area. This late deployment was to avoid their capture and duplication by the Allies. However, the Allies had already developed their own but had not used them for similar reasons. German pressure mines that could not be swept were nearly ready for deployment at the end of the war. 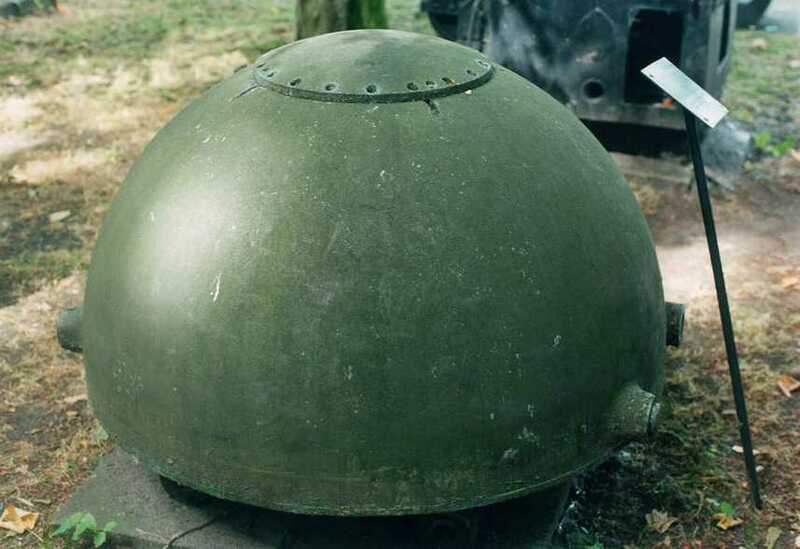 Postwar, Germany used British and USA mines until the 1960s, at which time Denmark and Germany began cooperating in developing a new generation of magnetic ground mines. EM Moored Contact mines. Mostly Hertz Horns. FM Shallow water contact mines, mostly moored types. German mines of World War II were all designated by letters, the first two indicating the function and the third the series designation within that category, usually indicating a modification. Postwar, new mine designations originally included the year that development started, but new mines now are designated by function. During World War I, Britain classified German mines into four general types. During World War II, Britain changed to a two letter code sequence to identify German mines, with the first letter being G (for "German") and the second letter given in a sequence as to when the first example was captured. Where possible, these codes are included in the tables below. 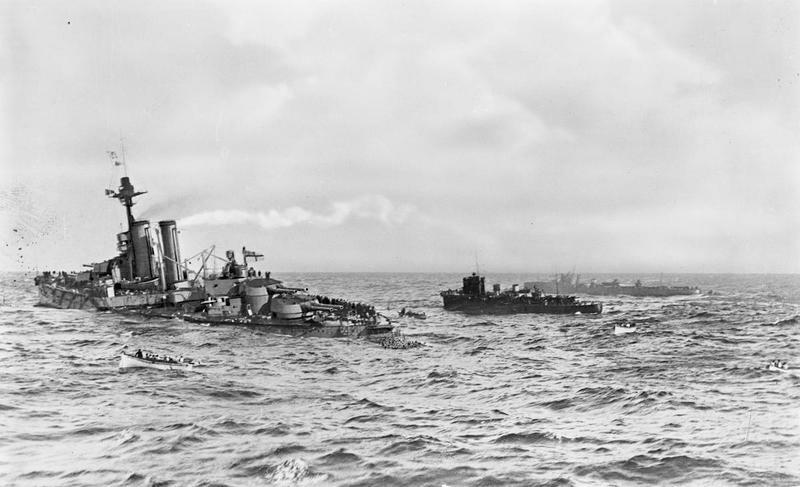 HMS Audacious sinking on 27 October 1914. A major success of German Mines during World War I. IWM photograph Q 48342. Germany started laying operations almost as soon as World War I was declared with the first mine field being planted by the auxiliary minelayer Koenigin Louise off Lowestoff on the night of 4/5 August 1914. Koenigin Louise was sunk the next day by the British cruiser HMS Amphion, but had her revenge on the following day when one of her mines sunk Amphion. During World War I, Germany laid more than 43,000 mines which claimed 497 merchant vessels of 1,044,456 gross tons (GRT), with one source claiming that the total was 586 Allied merchant ships. The British alone lost 44 warships and 225 auxiliaries to mines. Allied losses included two British and one French pre-dreadnoughts sunk by Turkish mines during the Dardanelles campaign. For all of the Allies, losses to mines included the new battleship HMS Audacious, seven pre-dreadnoughts and six cruisers. The loss of the cruiser HMS Hampshire to a mine was especially damaging, as the casualties included the British Secretary of War, Lord Kitchener, who was on a mission to consult with the Russian Government regarding the Eastern Front. Several U-boats were fitted as mine layers and one of these planted a field off the east coast of the USA which claimed the armored cruiser USS San Diego (ACR-6). In World War II, some 534 merchant vessels of 1,406,037 GRT were sunk by German mines. At least ten UK and US destroyers were sunk by German mines, but the only major Allied warship sunk was the cruiser HMS Neptune and the mines that sunk her were actually deployed by Italian ships. 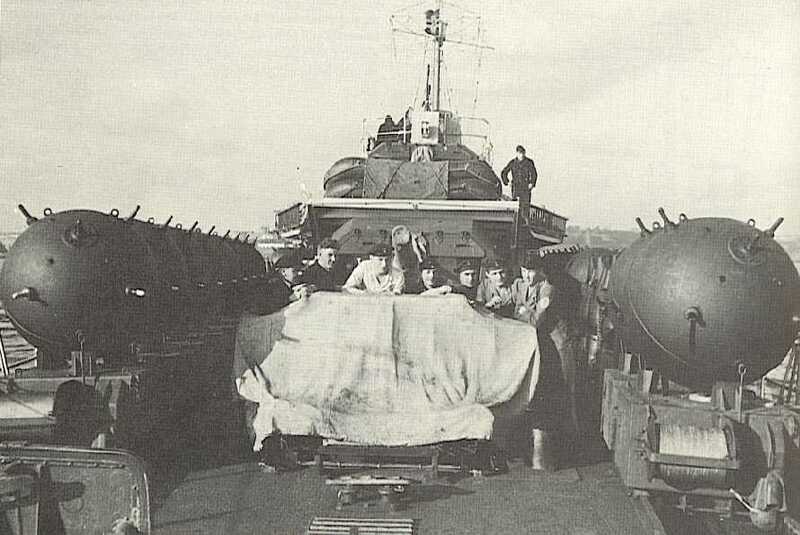 The peak success came in 1939-1940, when German aircraft, destroyers and minelayers were actively laying minefields off British harbors and no counter-measure against the magnetic mine had yet been developed. However, the greatest single success ever achieved by a minefield was by the one laid off Cape Juminda in the Gulf of Finland. This field inflicted great damage to the Soviet forces withdrawing from Tallinn (Reval) in August 1941. Out of the 195 warships, transport vessels, auxiliaries and 23,000 people that evacuated Tallinn, 53 ships and 4,000 lives were lost en route. Among the ships sunk were 25 out 29 of the larger transports, five destroyers, two corvettes, two submarines and two patrol boats. Some 2,828 German and Finnish moored mines were laid, mostly contact types along with some antenna types. In addition, about 1,500 explosive anti-sweeping devices were deployed in this field. As mentioned above, the Germans had reliable Hertz horned contact mines for much of World War I. Magnetic, acoustic and pressure mines were developed during World War II. Post-war mines have a variety of acoustic, magnetic and hydrodynamic/pressure sensors. Most mines produced during World War I used wet gun-cotton as the explosive charge although cast TNT was also used. It is possible that TNT-hexanitrodiphenylamine mixtures were used, similar to the torpedo explosives of that time. The standard explosive fillings for World War II mines were SW18 and SW36; S16, S18 and SW36 were used in the airborne mines. S16 was 31.4% ammonium nitrate, 5.9% sodium nitrate, 2.3% potassium nitrate, 9.7% cyclonite, 10.1% ethylene diamine dinitrate, 0.6% TNT and 40% aluminum. Information on the kind of explosives used for post-World War II mines is not available at this time. The standard German contact mine of World War I. This was first German mine with a chemical (Hertz) horn firing system. Original designation was Elektrische Minen A to distinguish it from pendulum-fired mines previously in use. This mine had a 330 lbs. (150 kg) wet gun cotton charge. Produced in two versions, one for surface ships and the other for specially fitted submarines. Production discontinued at the end of the war but substantial stocks remained and they were used in the early part of World War II (see EM Type below). The British captured one of these mines and essentially copied it to produce their first reliable mine of World War I. This was specifically developed as an anti-submarine mine and was introduced in 1915, with quantity production starting in 1916. However, it only carried a 44 lbs. (20 kg) charge and it does not appear that this mine sank any submarines during the war. Type I Mine. Painted inscription reads: "This German (Type 1) Mine was laid off Scarborough during the raid of 16th Dec 1914 and was swept up by the Grimsby mine sweeping flotilla. Presented by / Capt. F. Massy- Dawson, R.N. Port Mine Sweeping Officer Grimsby." IWM photograph MUN 4584. 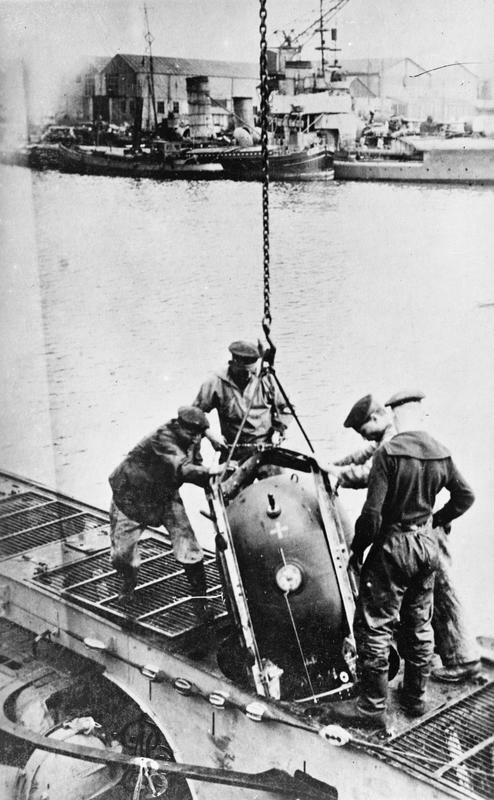 Type II mine being loaded into a UC minelaying submarine. IWM photograph Q 20345. EM = Einheits Minen, "Unity Mine" or Elektrische Minen, "Electrical Mine." A series of 13 different types of sea mines; EMA through EMI, EMK, EMR, EMS and EMU. With the exception of the EMS type, all of these were moored mines which could be laid by surface ships or by submarines. The EMH, EMJ, EMK and EMU types were either abandoned during the developmental stage or were incomplete at the end of the war. Very little information available for these types and for that reason they do not appear in the descriptions below. This was the E-Mine (see above) of World War I, stocks of which were still available in 1939. Oval mine 63 x 31.5 inch (1.6 x 0.8 m). Charge of 331 lbs. (150 kg) - may still have been the wet gun cotton charge of World War I, but possibly replaced with a more modern explosive type. Used 5 Hertz Horns. Could be moored in either 55 fathoms (100 m) or 82 fathoms (150 m). First captured by the British in January 1941. EMA mine now on display at the German Naval Memorial at Laboe. Photograph copyrighted by Peter Lienau. Similar to EMA but with a charge of 485 lbs. (220 kg). EMB Mine being laid from an S-Boote. Photograph from Suddentscher Verlag. 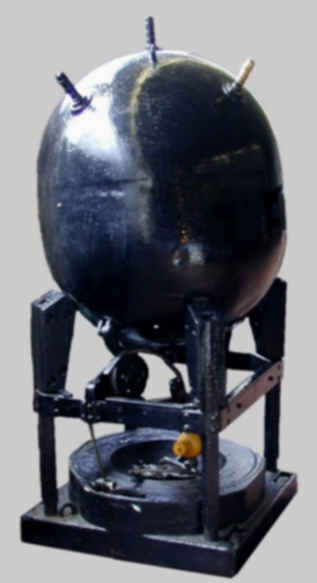 Spherical mine 44 inch (1.12 m) in diameter. Charge of 661 lbs. (300 kg). Used 7 Hertz horns. Could be moored in 55, 109, 164 or 273 fathoms (100, 200, 300 or 500 m). First captured by the British in October 1939. EMC Contact Mine Cross-section. Sketch from USN OP 1673A. Charge of 551 or 628 lbs. (250 or 285 kg). "KA" gear used a 98 foot (30 m) tube over the upper part of the mooring wire. When swept, this tube closed a switch and exploded the mine. This gear replaced the "KE" switch which fired the mine when the mooring cable was cut or the strain on it relieved. Both of these anti-sweeping mechanisms were later discarded as they were determined to be ineffective against sweeping operations. EMC Contact Mines aboard a Leberecht Maas class destroyer in Autumn 1940. Note the trolley rails. Charge of 551 lbs. (250 kg) and mooring depths of 55 or 109 fathoms (100 or 200 m). Introduced in 1943. The upper portion of the mooring cable was protected by 20 feet (6 m) of chain to make sweeping more difficult. In service in 1939. Charge of 628 or 551 lbs. (285 or 300 kg). Could be moored in 109 or 191 fathoms (200 or 350 m). Used upper and lower antennas but the upper one was removed in 1941. Similar to the above but with five Hertz horns. Introduced in 1943. The snagline was copied from a British design. Spherical mine 39 inches (1 m) in diameter. Used five Hertz horns with a 331 lbs. (150 kg) charge. Mooring depths were 55 or 109 fathoms (100 or 200 m). An antenna version with four horns was identified by the British as GV. 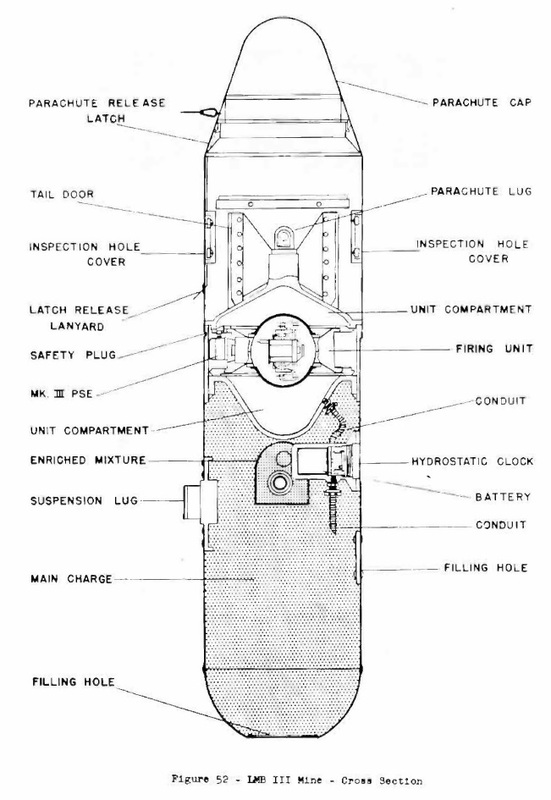 EMD Contact Mine Cross-section. Sketch from USN OP 1673A. A contact mine purchased from a British firm strictly for experimentation and for that reason designated as EME = Elektrische Minen Englische. Moored magnetic (influence) mine. Charge of 772 lbs. (350 kg) and moored in 109, 164 or 273 fathoms (200, 300 or 500 m). In service in 1939 but was considered to be sensitive to rough seas and liable to prematures. Moored surface mine developed from EMC and introduced in 1941. Later withdrawn as it was impossible to render completely safe. Used four Hertz horns and mooring depth was 98 fathoms (180 m). Anti-sweep obstructors utilizing the EMC casing with a single or double length of 0.625 in (1.6 cm) chain. Moored with the standard EMC sinker. EMS = Sehrohrtreibminen S. Drifting contact mine intended as a trap for ASW vessels. Made in three Models, EMS I, EMS II and EMS III which differed only in the floatation method. EMS I used a steel float designed to resemble a periscope. 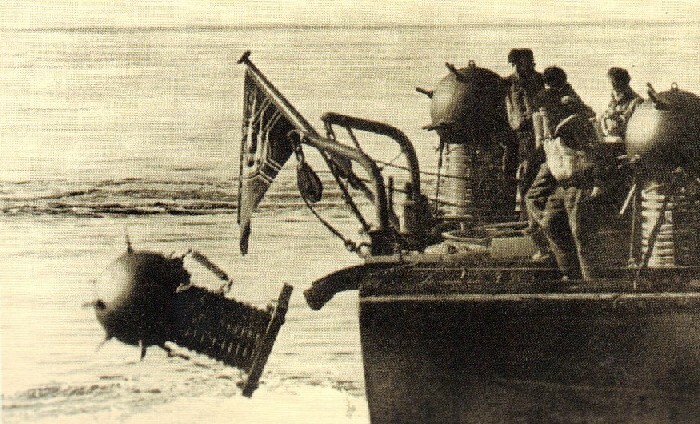 EMS II used a camouflaged eliptical float designed to ride flush with the ocean surface. EMS III used a hemispherical plexiglass float designed to resemble the Marder midget submarine cockpit. Although this mine was introduced in 1941 it was apparently not used up to mid-1943. Used five sensitive switch horns. Charge of 24 to 30 lbs. (10.9 to 13.6 kg). EMS I and II Mines. Sketches from USN OP 1673A. Moored contact mine with five Hertz horns and a 243 lbs. (110 kg) charge. Washed ashore in July 1940. 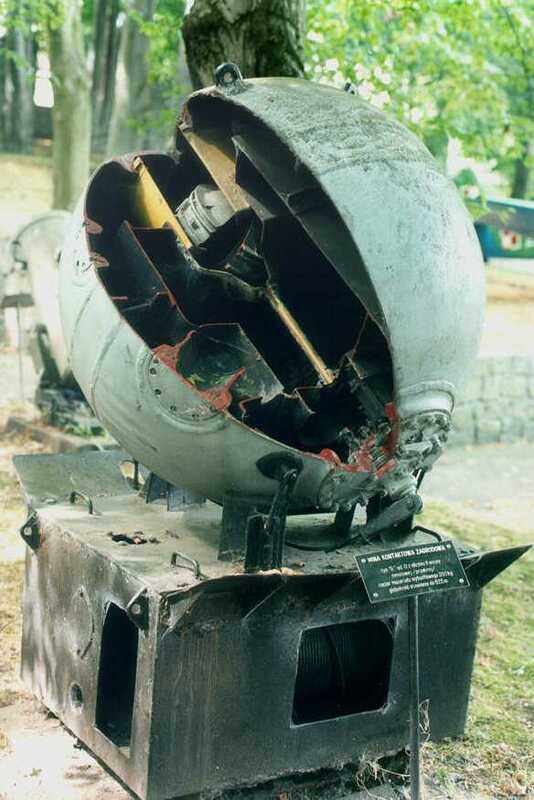 LM = Luft Minen "Air Mine" Type. A series of air-dropped magnetic mines. 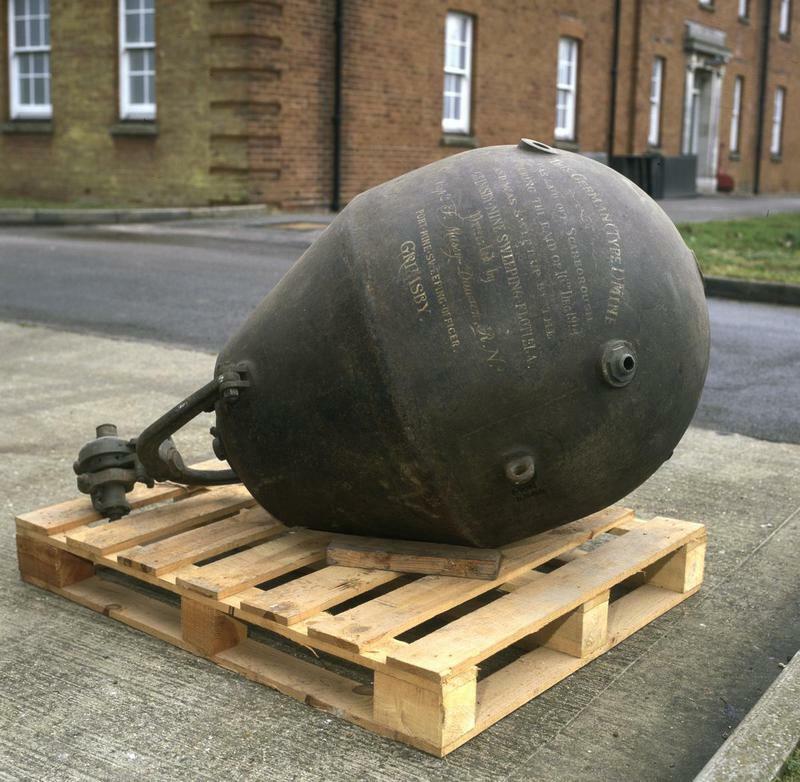 The LMA was the first German magnetic influence mine designed to be dropped from aircraft. Originally developed between 1928 and 1934. There were three models, known as LMA I, LMA II and LMA III, all of which were nearly identical, the differences being in methods of manufacture, small improvements to strengthen the mine case and modifications to the parachute assembly. Many of these mines were modified to allow them to be laid by surface ships, especially S-Bootes, and were then designated as the LMA/S. The LMA was relatively small for a ground mine and for that reason was not used as extensively as the larger LMB (see next entry) during the war. Manufacture of the LMA mines was discontinued early in the war and existing stocks were used up. Weight 1,213 lbs. (550 kg) with a charge of 661 lbs. (300 kg). Had a 22 second delay impact fuze which detonated the mine if it fell in shallow water or dry land. Removal of this fuze and the type of tail used were the primary changes for surface-ship use. Later versions were fitted with acoustic or acoustic/magnetic or pressure triggers. The first capture of an LMA Mine by the British was in July 1940. Early versions of the LMA were designated by the British as GA. The LMA and LMB were sometimes called "Oyster Mines" by the British as they lay on the bottom of the ocean, not floating like moored mines. The first LMA mine with a pressure fuze captured by the British. The mine was laid at Ubersee Haven in Bremen in May 1945 and is shown here being defuzed by Lt. George Gosse, RANVR. Lt. Gosse was awarded the George Cross for his actions. IWM photograph A 30625. Magnetic mine developed during the same period as the LMA. Very similar in design to the LMA, but with a longer case in order to carry a heavier charge. The LMB was probably used more than any other German influence mine. There were four models used, the first three similar to the LMA models. Model LMB IV was a further modification of the LMB III in which a large part of the cylindrical case was made of plasticized pressed paper (press-stoff) and the hemispherical nose of the mine was made of bakelite in order to conserve aluminum. Late in 1944 some were fitted with pressure/acoustic triggers. Weight of 2,116 lbs. (960 kg) with a 1,554 lbs. (705 kg) charge. Similar to the LMA/S, the LMB/S was introduced in 1943 for use on S-boats. A later version of this mine was designated by the British as GB. 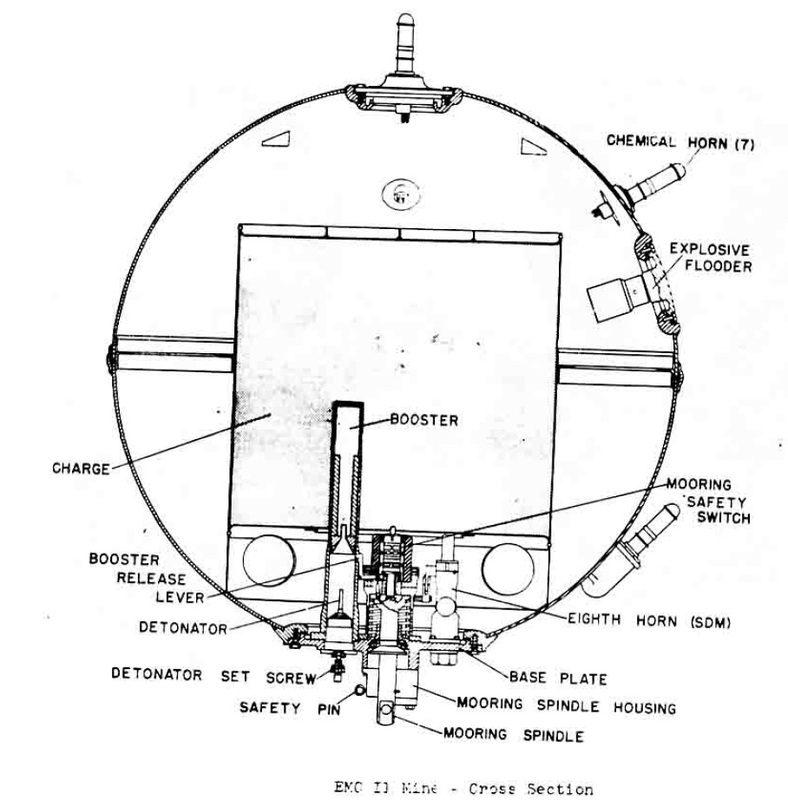 LMB III Mine sketch from USN OP 1673A. Experimental moored type intended to be laid from the He 59. Did not enter service use. This was the first attempt to develop an aircraft laid moored influence mine. Development halted in 1937 and did not enter service use. Moored influence mine designed for aircraft but first used by S-boats in 1943 as type LMF/S. Weight of 2,315 lbs. (1,050 kg) with a charge of 639 lbs. (290 kg). Could be moored in waters up to 164 fathoms (300 m). Nomenclature note: There was no "LME" mine designation assigned. Moored contact mine with five Hertz and three switch horns. Charge was 66 lbs. (30 kg) and was 31.5 inches (80 cm) in diameter. Could be moored at either 160 or 320 feet (50 or 100 m). Drift mine version with five Hertz horns and a 106 lbs. (48 kg) weight introduced in 1942. Other details the same as UMA. Improved moored contact mine with five Hertz and three switch horns. Charge was 88 lbs. (40 kg) and was 33 inches (84 cm) in diameter. Could be moored at 210, 330, 490, 640 or 980 feet (65, 100, 150, 200 or 300 m). A hydrostatic flooding device that acted if the mines rose above a set depth was introduced in 1940 so that German ships could pass over minefields. UMB type with same attachments as EMC m KA (see above). 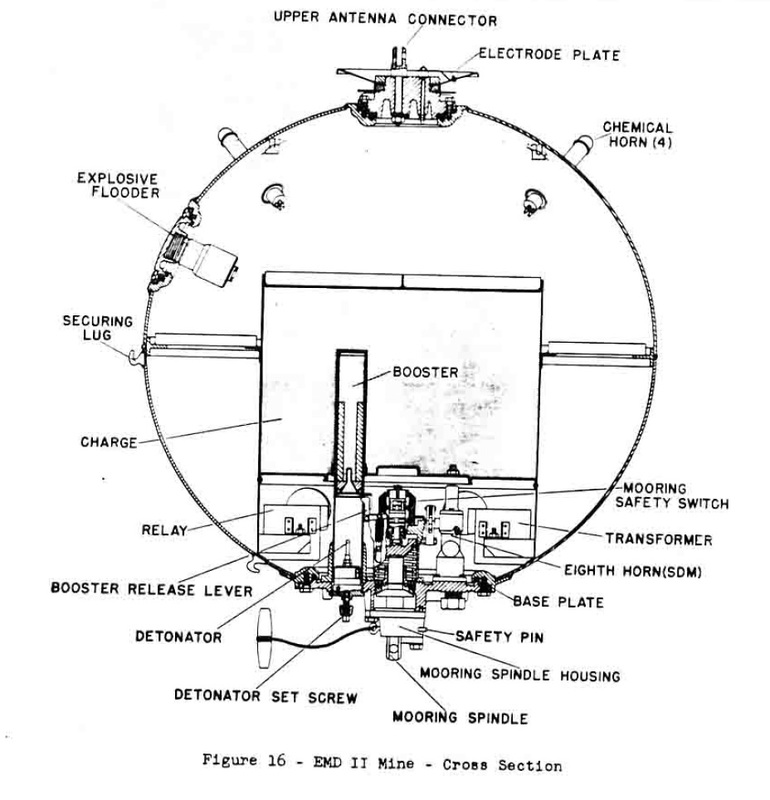 Hemispherical ground magnetic mine laid by surface craft. The charge was approximately 1,764 lbs. (800 kg). Known as the Schildköte (turtle mine). In service 1939. Magnetic Ground Mine Type RMA. This mine is now at the Polish Army Museum, Warsaw. Photograph copyrighted by Michal Kopacz. Similar to RMA and also in service in 1939 but was smaller with a 1,014 lbs. (460 kg) charge. A ground mine with several different kinds of magnetic influence triggers, laid by surface craft. Designed to use the smallest possible quantity of scarce materials and it was noted that this mine lay better on the seabed than did the cylindrical type. Charge of 992 lbs. (460 kg). A rectangular box-shaped ground mine with a wood casing to reduce detection. Laid by surface craft. Charge of 1,698 lbs. (770 kg). Moored influence mine for laying from the vertical mine tubes of Type VIID and XB U-boats. Introduced in 1942. Made of a aluminum alloy shell to reduce detection. Could be moored either 219 fathoms (400 m) or 328 fathoms (600 m) deep and had a 772 lbs. (350 kg) charge. Moored Magnetic Mine Type SMA. This mine is now at the Polish Army Museum, Warsaw. Photograph copyrighted by Michal Kopacz. Moored influence mine laid from the TT of U-boats. First captured in 1941. Used an aluminum alloy shell and used a 82 fathom (150 m) or 148 fathom (270 m) cable. Charge was 507 lbs. (230 kg). A ground influence mine in service in 1939. Later, acoustic and acoustic/magnetic fuzed types were introduced. The cylindrical shell was aluminum alloy and was said to lay badly on the seabed. Charge varied between 926-1,235 lbs. (420-560 kg) and the mine was normally laid in waters of 12-15 fathoms (22-27 m). A design for laying from the torpedo tubes of S-boats, the TMB/S, was introduced in 1940. 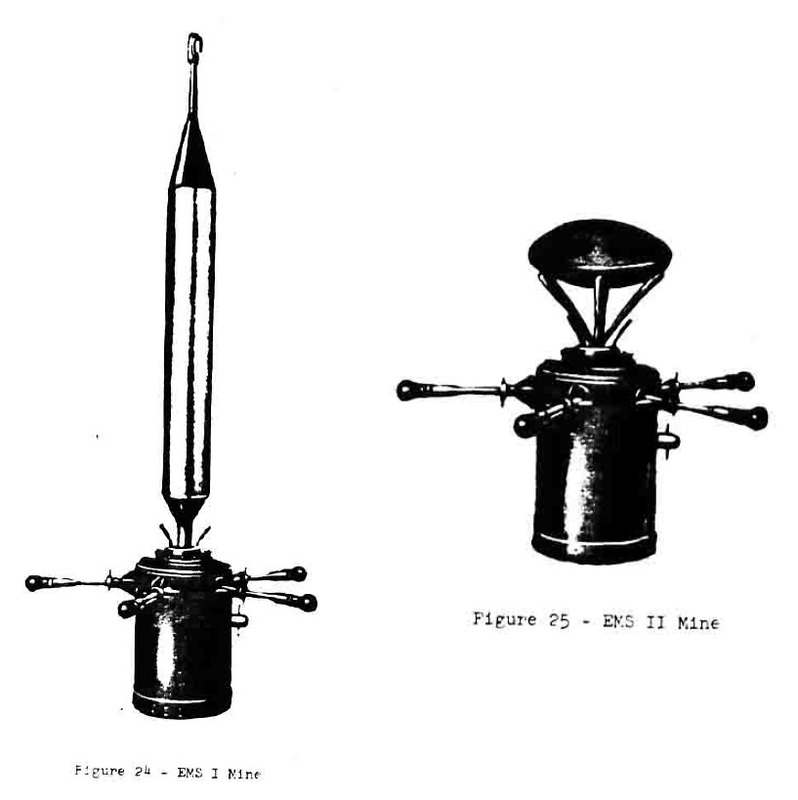 Ground mine with influence fuzing introduced in 1940. Basically an enlarged TMB. Available fuzes included acoustic and acoustic/magnetic after 1942. Charge was 1,896-2,050 lbs. (860-930 kg) and could be laid in waters up to 20 fathoms (37 m) deep. Submarine launched ground mine built of non-magnetic material. Weight of 1,698 lbs. (770.5 kg) with a 1,179 lbs. (535 kg) charge. Size is 91 in L X 21 in D (231 cm L X 53.4 cm D). Maximum effective depth of 197 feet (60 m). Built by Faun-Werke and introduced in 1980. Joint Danish-German project developed for launching from fast attack craft. Mines were originally designated as SGM 80 (Seegrundmine 1980). The fuze is microprocessor based and accepts acoustic, magnetic and hydrodynamic signal processing channels. Weight of 1,543 lbs. (700 kg) with a 1,102 lbs. (500 kg) charge. Size is 71 in X 24 in D (180 cm L X 60 cm D). IGM 10 is a derivative intended to be laid by submarines. Manufactured by STN Atlas Elektronik GmbH and introduced in 1986. 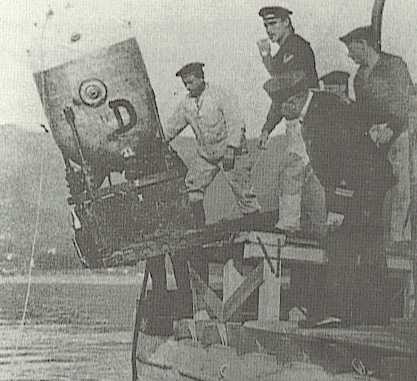 Sea mine intended to neutralize new types of targets such as surface-effect ships. No details available. Another Danish-German project, this one manufactured by AEG/Telefunken (Germany) and Wedel (Denmark). Initials stand for Seemine Anti-Invasion. Intended to be laid by landing craft and helicopters in close-coastal waters. Weight of 254 lbs. (115 kg) with a 132 lbs. (60 kg) charge. Size of 31.5 in L X 14.2 in D (80 cm L X 36 cm D) when deployed with mine-laying rails on surface ships. Introduced in 1987. "German Destroyer Minelaying Operations off the English Coast 1940-41" article by Pierre Hervieux in "Warship Volume IV"